"As the leader of an ancient civilization, explore unknown lands in order to develop your empire. Found new cities and construct buildings in order to exploit natural resources, establish trade routes. Set out to conquer barbarian villages or increase your scientific knowledge. This is the first of what are now known as deck building games. 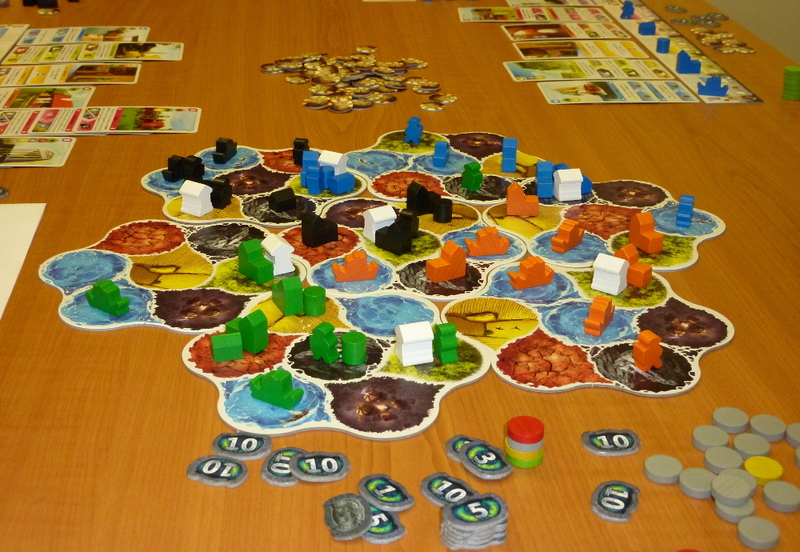 Each player has an individual deck which is fixed at the start of the game. During the game on their turn, they can play one action card and can then use treasure cards and money from played actions to buy further cards from a common supply to add to their deck, which will increase their options in later turns when the deck has been shuffled. At the end of the turn they will discard any unused cards before drawing 5 cards for use in their next turn. 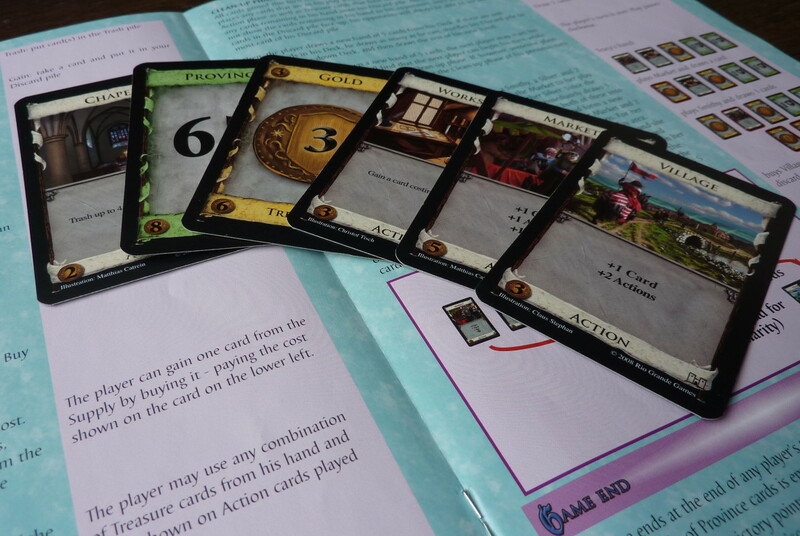 Action cards confer effects such as allowing the drawing of cards, taking further actions or making additional buys on their turn. Treasure cards add to the player's buying power, while Victory cards give points which determine the winner at the end of the game. Players must strive to achieve the best balance to their decks, remembering that a handful of action cards is no good unless they can give extra actions, otherwise you can only play one. Victory cards have no value during the game so drawing a handful of them will mean a wasted turn. The game ends when three of the card supply piles are exhausted or the single pile of Province Victory cards is exhausted at which time players count up the value of all the Victory cards in their decks. There are a number of expansions to this game adding extra cards , which include new types of cards and cards combining more than one type. "Elder Sign is a cooperative game in which one to eight players assume the roles of investigators struggling to combat one of the Ancient Ones – hideous, powerful creatures that dwell in the space between dimensions. The investigators face adventures in and around the Miskatonic University Museum, where the Ancient One’s imminent return is causing a number of bizarre events. By overcoming these encounters, the investigators hope to acquire Elder Signs, which they need to seal away the Ancient One and rescue their imperiled dimension. Somehow the Lord of Vampires has survived to plot his terrible revenge upon an unsuspecting living world. And now, nearly a decade later, he is abroad once more spreading his vile plague. This time, however, he has learned from his past mistakes and is acting with even greater cunning than before. Many scientific men do not understand the terrible force behind the recent spate of mysterious deaths, but there are a few who do. Of this handful, four have joined together once more, bound by oath, to finish properly a job started eight years ago. This time Count Dracula will be destroyed! 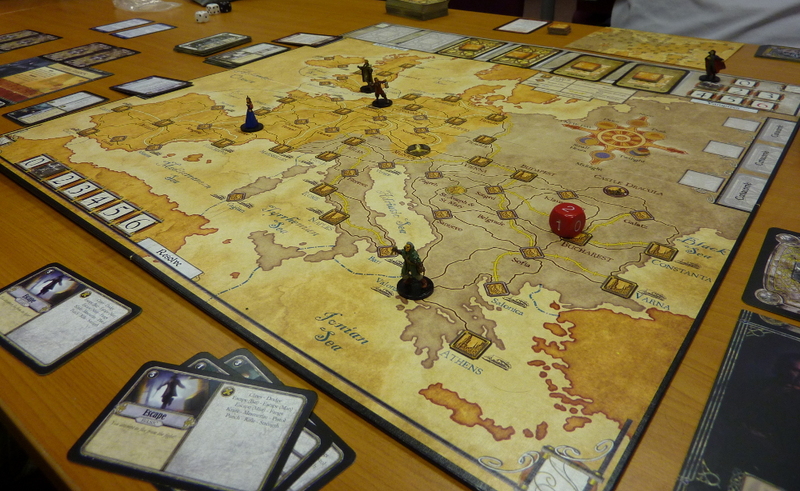 This is a game where one player plays Count Dracula, while the others combine to defeat him. The Count moves secretly around the board spreading traces of his passage for the hunters to find and confront in the way of encounters, he must accumulate 6 vampires by succeding in maturing new vampire encounters, defeating hunters (either personally or by proxy) or by simply surviving each day. The hunters must track down the Lord of Evil and defeat him in combat before he can achieve his goal.